Sen. Imani Ross, U-at-Large, and Sen. Jan Yonan, CCAS-U, are convening a task force this month to conduct background research on prominent names featured on University buildings. Updated: September 12, 2017 at 11:08 a.m.
A group of student leaders is launching an effort to examine the people behind University building names to determine if individuals with bigoted or discriminatory views are being honored on campus. Student Association Sen. Imani Ross, U-at-Large, is convening an informal task force beginning this month, comprised of about 10 students from the SA and student organizations, that will conduct background research on prominent names on University buildings. Ross said students will use the research to determine whether some buildings should be renamed at a time when campuses and cities across the country are grappling with how to remember historical figures who held offensive beliefs. Ross, who hosted a town hall on the subject last academic year, said the committee will pay particular attention to the Marvin Center, named after long-time former University President Cloyd Heck Marvin. 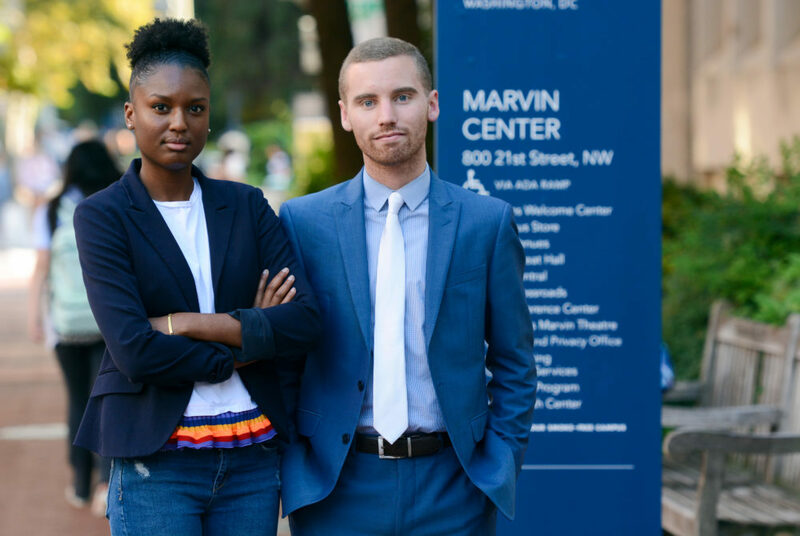 Based on her research into Marvin’s life and administrative policies, Ross said the former president, who served between 1927 and 1959, doesn’t deserve to have his name attached to GW’s main student hub. During his tenure, Marvin doubled enrollment, tripled the size of the faculty and increased the endowment eightfold. But he also openly supported the University’s segregationist policies and was known for being religiously intolerant and restricting free speech on campus. “It’s not about erasing his name, but it’s more about changing history and making it better and holding the people that we name in honor on our campus to a higher standard – the same way they hold us accountable as students – to be inclusive, to be open to other people’s ideas, to be able to have dialogue,” Ross said. University spokeswoman Maralee Csellar said officials are aware of the opposition to the Marvin Center’s name, which began when Marvin’s wife donated to rename the building in 1971. “There are many ways that universities come to terms with their history, and we are open to discussions and ideas about how best to understand and recognize the totality of the Marvin legacy,” she said in an email. But Ross said renaming the Marvin Center is not the main purpose of the task force. Instead, it will look at all buildings named after people on campus and create a set of guidelines to evaluate whether the names are appropriate. The task force will use the University’s mission statement, which calls for “cultural and intellectual diversity” to rate building names on “a spectrum from zero to problematic,” she said. The task force will look at the Marvin Center and other named buildings to get “a more healthy understanding of who’s honored,” she said. It will meet between two and four times each month and will research individual buildings’ naming history, though some of the meetings may be town hall-style, Ross said. So far, three student organizations have signed on to send representatives to the committee: GW’s NAACP chapter, the GW College Democrats and Young Progressives Demanding Action. Ross said she is in discussions with other organizations – including more conservative ones – to gauge their interest. She said she would also consider adding faculty and officials to the committee. “There’s no tension – it’s not a demand, it is a collaboration,” Ross said about the approach of the task force. Abiola Agoro, the president of GW’s NAACP chapter who is a member of the task force, said the group will also search for individuals to contribute naming donations to the University so that buildings like the Marvin Center can be renamed without impacting GW’s financial standing. She said the College Democrats’ executive vice president will be a member of the committee. “Students of any racial or religious background should be able to access their student center without being reminded that, at one time, the University did not want them here,” Kay said. Keiko Tsuboi, the chapter leader of Young Progressives Demanding Action, said the organization supports the work of the task force, but she will not personally be a part of it. Honoring slave holders and others who held discriminatory views overlooks their racism “as long as they were a great leader for white Americans or other people,” she said. “That’s not good enough anymore, we need to move forward,” Tsuboi said. More than 20 GW buildings are named after people – largely for major donors or prominent alumni – like Jacqueline Kennedy Onassis and Mabel Nelson Thurston, who was GW’s first female undergraduate. In 2014, Ivory Tower residence hall was renamed for Mark Shenkman, an alumnus and trustee who donated $5 million to career services. The task force reflects a larger movement sweeping college campuses and cities across the nation – coming to terms with a discriminatory history. Ahead of the decision, Yale’s president established a committee to establish guidelines on renaming, which produced criteria like whether the person’s principal legacy conflicts with the university’s mission and the reasons the university decided to honor that person. In 2015, Georgetown University decided to rename two buildings on its campus named for former presidents who sold slaves to pay off University debt in the 19th century. Although activists have said universities shouldn’t honor people who were contemptuous of racial, ethnic and religious groups, some critics condemned the moves as trying to erase history. SA President Peak Sen Chua and Executive Vice President Sydney Nelson said they support the creation of the task force, but would not take an official stance on specific proposals – like renaming the Marvin Center – until formal recommendations are made. “I think the goal is to figure out where student support is and how students feel about this, how it affects their lives,” Nelson said. “We are hoping to look at all names on campus and all figures that have a very central role in the University and just ensuring that those do correspond with the values of the University and who we are today, not who we were 40 years ago, 60 years ago,” he said. The Hatchet reported that SA President Peak Sen Chua and Executive Vice President Sydney Nelson do not have an official stance on the project. They said they would not take a stance on specific proposals until formal recommendations are released, but that they are supportive of the overall effort to examine building names. Justine Coleman and Meredith Roaten contributed reporting.